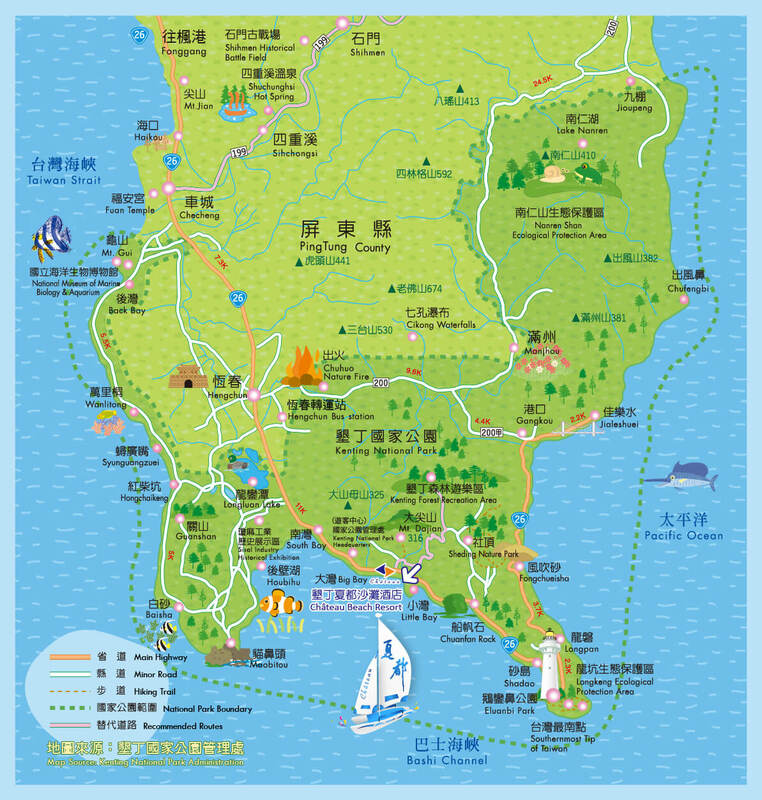 1.Take THSR from Taipei to Zuoying Station, it will take about 1.5～2 hours; Take THSR from Taichung to Zuoying Station, it will take about 1 hours. Additional purchase Value Package / Extra Package which provides the pay-shuttle service from “Zuoying Station (THSR) to Château”, only one daily shuttle with limited seats, thus we recommend you to make reservation from Château in advance. *Arrival time shall be based on the traffic condition. *Stop of Shuttle：Exit No. 2 of Zuoying THSR Station. 1.Via National Highway No. 1：From National Highway No. 1, link to Provincial Highway No. 88, and link to National Highway No. 3. Exit in Nan-cho Township and take a left turn, and then follow the traffic signs to link Provincial Highway No. 1 to Fenggang. Continuously take Provincial Highway No. 26 toward Kenting, and it’s about 5 more minute driving to Château when passing Nanwan. 2.Via National South Second Highway：Exit in Nan-cho Township and take a left turn, and then follow the traffic signs to link Provincial Highway No. 1 to Fenggang. Continuously take Provincial Highway No. 26 toward Kenting, and it’s about 5 more minute driving to Château when passing Nanwan. *Seats limited and easily full in high season, please make such reservation of shuttle in advance. *Shuttle Reservation Service：Providing the shuttle reservation service from KHH to Château, it needs to make room reservation in advance.